In the mid 18th Century, the regular infantry fought deployed in closed formations, three or four ranks deep. Fire was delivered either by ranks or by whole platoons or divisions, the latter tactic requiring more discipline and coordination, but allowing for a higher rate of fire. 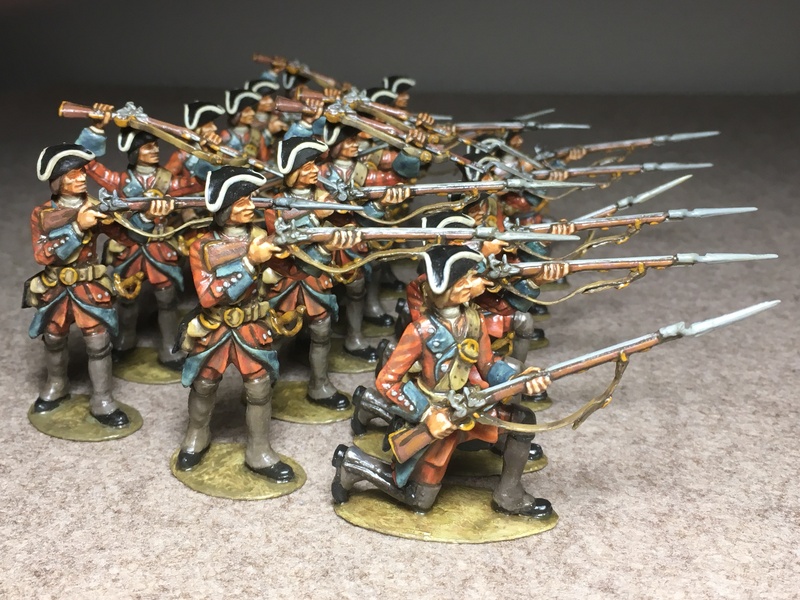 Platoon fire was developed by the Dutch at the close of the 17th Century, and was readily adopted by the northern German armies – the Prussians, Hessians, and Hanoverians. The British in turn adopted platoon firing, and soon excelled in it. When firing by platoons, a whole section of the battle line (a platoon, or division) fired with all its ranks at the same time, while the remaining platoons waited their turn of firing, or reloaded. This firing tactic, also referred to as rolling fire, could be performed by units deployed up to three ranks deep, the front rank kneeling and the center and rear ones standing. Conversely, the French, and the armies of the southern and central German states – notably Austria – were slower in adopting the new firing tactics, and remained wedded to the four-rank formation, and to firing by ranks, throughout the War of the Austrian Succession and well into the Seven Years War. An important factor in this delay was perhaps that the French military doctrine relied little on musketry, and rather favored the bayonet charge as the deciding factor of an engagement. Nosworty, B. The Anatomy of victory. Battle tactics 1689-1763, Hippocrene Books, New York, 1990. Nice painted and setup Nino. Looks like they are bracing for a charge. I am going to the East Coast Toy Soldier Show next weekend. Take Care for now, Mike. Thank you Mike, and enjoy the show!